The two groups hurled chairs at each other leading to tension for sometime. Police dispersed both the warring groups restoring normalcy. 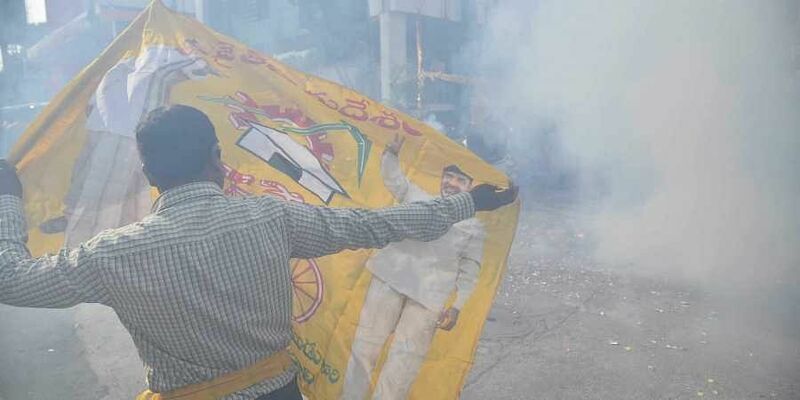 VIJAYAWADA: Activists of TDP and YSRC clashed following a heated argument during Janmabhoomi-Maa Vooru programme held at Vuyyuru on Thursday.Trouble started when former minister and YSRC leader K Pardhasarathy went to the Janmabhoomi-Maa Vooru programme at Vuyyuru in which local TDP MLA Bode Prasad and MLC YVB Rajendraprasad were taking part. The YSRC leader raised the issue of alleged irregularities in allotment of houses to beneficiaries and the same were contended by the MLA. This led to heated arguments between the two leaders and within no time tempers ran high resulting in a clash between TDP and YSRC activists. The two groups hurled chairs at each other leading to tension for sometime. Police dispersed both the warring groups restoring normalcy.